The ukulele has become a hit among young and experienced musicians alike. The instrument has four strings and a unique tone, and it mainly comes in four sizes: soprano, tenor, baritone and concert. Although the soprano ukulele is the most commonly used size, the concert-sized ukulele has gained a great deal of popularity in recent years. Concert ukuleles have a wider fretboard than soprano ukes, which makes it easier to play for people with larger hands. They also have a slightly warmer and deeper tone than sopranos and the longer neck lets them hit a wider range of notes. There are a lot of concert ukuleles on the market out there, some good and some not-so-good. Price, sound quality, type of wood used, construction and overall playability are all factors to consider when picking out a ukulele. To help you find the best ukulele for you, we’ve compiled this list of the top instruments out there. The Cordoba 15CM is an excellent choice for a quality concert ukulele. Cordoba has been making ukuleles since 1997 and they have developed a strong reputation as makers of quality instruments that sound great. The Cordoba 15CM is one of their most popular models due to its solid construction, great sound, and traditional appearance. The 15CM features an all-mahogany body, and the rosewood fingerboard has a total of 18 frets. This instrument is made entirely by hand, and features an abalone rosette and elegant satin finish, things you just don’t find on ukuleles in this price range. 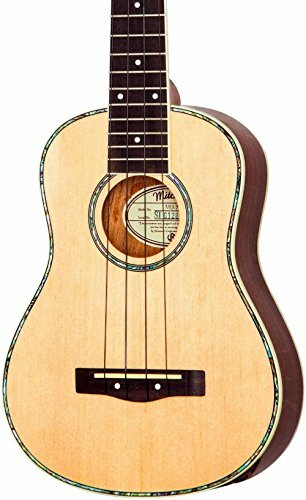 Because of its good quality and affordable price, this is a great ukulele for beginners and might also be the best concert ukulele under $100. The Lanikai LU21-C is an excellent ukulele that comes at a very reasonable price. Lanikai is a Hawaii-based company that has a reputation for producing top quality instruments, and this one is no different. Lanikai is very in tune with the ukulele industry as a whole, and all of their ukuleles must pass rigorous testing and approval from the Hawaiian ukulele community. The LU21-C has 22 frets and is made of rosewood. 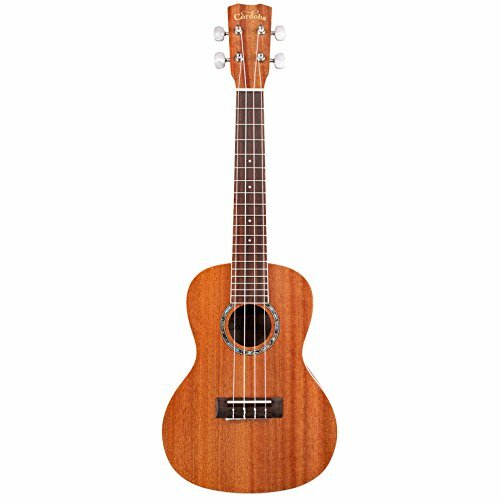 Unlike some inexpensive ukuleles, the Lanikai stays in tune and is very comfortable to hold and play. 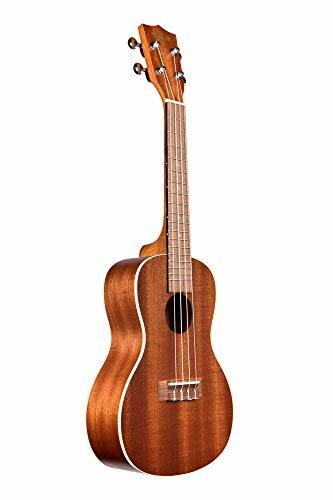 There are very few ukuleles in this price range that can compete with the sound and construction of the Lanikai LU21-C. At this price, it’s easily one of the best concert ukuleles under $200. The Kala Satin Mahogany Concert Ukulele (Kala KA-C) is proof that you can buy a top notch ukulele at an affordable price. Kala is a comparatively new ukulele maker, but they have become very popular and have gained a great reputation for their great quality and innovative ukuleles. This great uke features mahogany construction, a rosewood fingerboard and bridge, and geared tuners. It has a deep and mellow tone, great intonation and it stays in tune. While this ukulele is suitable for beginners, it’s good enough to grow with you as you improve as a player. The Kala KA-C is a great concert ukulele for players of all levels. Alvarez is a very underrated maker of excellent instruments. While they are best known for their guitars, Alvarez has introduced a great line of ukuleles in recent years. The Alvarez AU70C Artist Series concert ukulele is a fine instrument with quality appointments, good projection and volume, and a rich, open-sounding ukulele tone. This uke features a Sitka spruce top and mahogany back and sides, giving it a rich tone with a lot of punch. Premium tuners, rosewood fretboard, real bone nut and saddle, dovetail construction and a unique bracing design make this an excellent ukulele with features you’ll find on high end guitars. Playing this ukulele is an amazing experience, and it will definitely be a good choice. The Mitchell MU70 is an affordable mid-range ukulele, and its rich tone and overall quality makes this a great option for beginners, intermediate or advanced players. This uke features a laminated spruce top and rosewood back, sides and fingerboard. The high gloss finish and beautiful inlays make this a stunning instrument. The MU70 is very comfortable to hold and play, and it puts off a great sound. The tone is full and complex, with that cheerful tropical sound that ukuleles are known for. This uke also comes with premium Aquila strings, which help bring out its unique tone. All of the ukuleles on this list are top quality, and you really can’t go wrong with any of them. But each of them is unique in their own way and have their own tone and feel. The reviews and videos above should give you an idea of which one is best for you. The ukulele is a wonderful instrument and it’s quite fun to play. It’s also one of the easiest instruments to learn and it’s very affordable compared to other instruments. If you want something that’s a little larger and deeper than a soprano uke, a good concert ukulele may be the perfect instrument for you. I have a Kala Satin Mahogany Concert ukulele. I really loved it. perfect fit for a beginner like me. I don’t agree with Lanikai though. I had a bad experience with some of their ukuleles in the past. I have Cordoba 15CM Concert Ukulele. This is stylish, Good and long-lasting Ukulele. I would recommend buy this one.